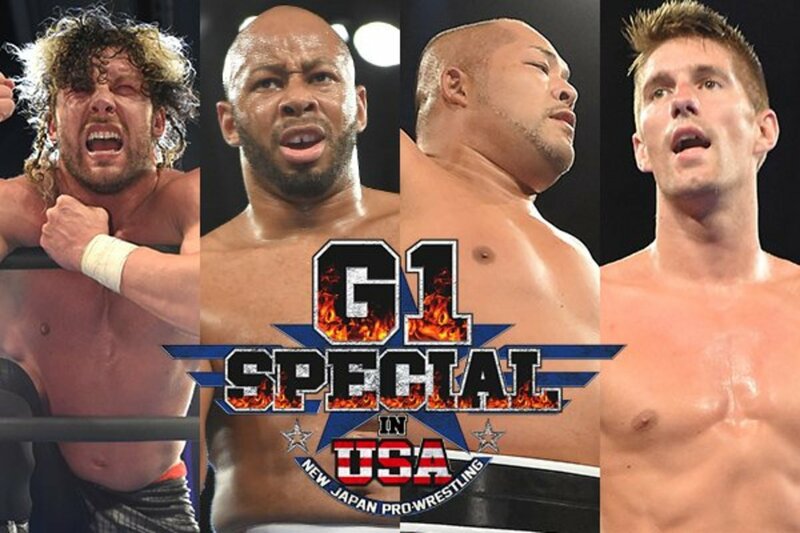 The first IWGP United States Heavyweight Champion will be crowned as New Japan Pro Wrestling hosts another G1 Special in Long Beach, California tonight. The semifinals and finals of the US title tournament will take place on the show. After their wins last night, Kenny Omega and Jay Lethal will face off on one side of the bracket, with Tomohiro Ishii and Zack Sabre Jr. squaring off on the opposite side. Whoever wins those matches will meet in the finals. Also on the show, two more titles will be up for grabs. In an unusual matchup, Hiroshi Tanahashi will defend his IWGP Intercontinental Championship against Billy Gunn. And The Young Bucks will put their IWGP Junior Tag Team Championship on the line against Roppongi Vice. Multi-man tags highlight the rest of the card, including Cody Rhodes, Bad Luck Fale, Yujiro Takahashi & Marty Scurll teaming against Kazuchika Okada, Will Ospreay & The Briscoes. The show will be available to watch live on New Japan World in the United States and everywhere else where the service is available. Our coverage begins when the event starts at 8 p.m. ET. Fun opener. Crowd HATED Yoshitatsu. At the start of the match, all six guys climbed the ropes to get crowd reactions and they loved Liger's team and hated Yoshitatsu's. They got the ref to go up and the crowd loved him to. JR, at one point, called Komatsu and Tanaka the "Teriyaki Boys"....woops. Tempura Boys did most of the work for their team but Yoshitatsu looked okay in his limited time in there. Liger had a long heat spot and then made his own comeback on all 3 opponents. Then everyone got a chance to do their stuff before Finlay locked on a stretch muffler on Yoshitatsu. Tempura Boys ran in and Liger put a surfboard on one of them and Kushida the Hoverboard lock and Yoshitatsu tapped to give Finlay and his team the win. Omega got past Michael Elgin to advance in a really good match last night while Lethal won over Hangman Page to earn his spot in the semifinals. Great match. Story was Lethal had damaged ribs coming into last night's show and it got worse after the Page match. Lethal had his moments and even briefly turned the crowd after three superkicks and a Lethal Injections looked like it might get him an early pin but Omega rolled out of the ring before Lethal hit his 3 running dives. Duelling crowd chants through a lot of the match but they were solidly behind Omega at the end. Omega really worked over the rips in the latter part of the match . Lethal then hit a Blue Thunder Bomb out of nowhere but couldn't cover because he hurt his ribs again. Ishii upset Tetsuya Naito to book his spot in the semis while Zach Sabre Jr submitted Juice Robinson to advance. Best match of the tourney so far. Sabre was working submissions almost the whole match, while Ishii would struggle to get out and usually power out with headbutts. Key spot in the match was about ten minutes in when Sabre Jr had a combination triangle and Kimura lock. Ishii was struggling for the ropes and Sabre Jr kept grabbing limbs. Crowd exploded when Ishii finally made the ropes. Sabre Jr started to get cocky and throwing more strikes. Ishii was begging him on. Sabre Jr hit a penalty kick but then was hit by lariat by Ishii. Ishii finished it with a brainbuster to advance. Crazy lucha match with a ton of moves and not much psychology but real good if you like this sort of thing. Duelling LUCHA LIBRE/LIJ chants which got louder and louder for LIJ. Volador Jr wrestled with his mask for this one. - Dragon Lee and Tanashi slapping the hell out of each for over a minute which the crowd loved. Jay White and Bushi worked most of the last two minutes of the match. Bushi hit a missile dropkick and then a Spinarooni. White then hit a Rock Bottom and a Flatliner on Bushi to get the pin for his team. Not sure if JR used this word at all during the match but this was a slobberknocker if you've ever seen. Elgin and Page started off with Page trying to show that he could hang with Elgin in the strength department to no avail. After a few minutes of Elgin and War Machine overpowering all three of their opponents, eventually Hansen was stuck in there for awhile while GOD and Page tagged in an out. Hansen made his own comeback before GOD double teamed all three opponents separately. Rowe was back in by himself and got more or less out of nowhere by Hangman Page, who hit him with the Page Turner for the win. Finish came off really flat as no one was expecting it. WINNERS - BULLET CLUB when Hangman Page pinned Ray Row in 11 minutes. They made an announcement after this match that NJPW would return to the US in 2018. Obviously that was going to happen. Long intermission with nothing but crowd shots and generic rock music in the background. While I have moment, my condolences to Dave Meltzer and his family on the loss of his father today. My thoughts and prayers are with you, Dave. Incredible match. Matt spent the whole match trying to get a Sharpshooter and it eventually played into the finish. I counted 16 superkicks by the Bucks, which is probably about average for one of their matches. First sick spot of the match was Nick hitting a superkick on Trent, who was being held by Matt on the apron. Matt then hit a running power bomb on the ramp on Trent, who was out for awhile. Bucks doubleteamed Rocky for a long time and eventually the pro-Bucks crowd was chanting for him. Trent eventually got in and ran wild on the Bucks. Trent and Nick were in together for awhile. Trent hit a tornado DDT on Nick. Eventually Bucks took over and Matt powerbomed Rocky onto Trent's back in a sick spot. Bucks hit a Meltzer driver off the top turnbuckle onto Rocky after Matt caught him doing a dive outside the ring. It only got two but the crowd erupted in a MELTZER chant and JR and Barnett sent condolences to Dave in a nice touch. Back in the ring and the Bucks eventually hit another Meltzer driver, sending it out to Dave and then both Bucks put both members of Rappongi Vice in Sharpshooters to get the pin. After the match, Ricochet did a run-in and lait out both Bucks, challenging them to a Jr tag title match against he and Taguchi. Rocky Romero did a promo, basically breaking up the team and sending Trent on his own into the heavyweight division. Cody got his own entrance from the rest of the BC. Fale was wearing a shirt that said "Make Jobbers Great Again". That was awesome. Surprisingly this match was mostly comedy. Mark Briscoe and Marty Scurll opened, doing their crow and crane stuff and the crowd ate it up. Then came a sequence where for five minutes, no one locked up with anyone as people were just tagging in and out while the crowd was eating it right up, telling everyone who to tag to. Eventually they got to wrestling and Okada and Fale were in a few minutes against each other. While Okada was down, Fale tagged in Cody and they went at it for a bit with neither guy really getting the advantage. Ospreay started to run wild, doing a bunch of different flying moves on Cody and Yujiro and while Ospreay was coming off the top rope, Cody caught him with a disaster kick in mid-air and then hit the Crossroads for the win. Cody grabbed the world title belt and held it up, which the crowd hated. Despite the opinion of a lot of people on my Twitter feed, this was better than it had any right to be. Tanahashi was in control early, doing mostly ground work after headlock takedowns. Gunn took over with a Flatliner and started working over the injured arm of Tanahashi. He looked pretty bad when he would run the ropes but other than that, he was methodical and it was fine. There was a spot where Tanahashi pulled down Gunn's tights and he had another pair of trunks on underneath that were neon. Then Gunn pulled down Tanahashi's trunks and we got a full moon. Gunn hit a One and Only and got a near fall. Tanahashi hit a neckbreaker and went for the High Fly Flow but Gunn rolled out. Gunn hit a Famouser and the crowd totally bought it as a finish but Tanahashi kicked out. Tanahashi then hit a sling blade and the High Fly Flow to win. Another incredible match, at least 4 3/4 stars in my book. They started out doing strong style right out of the gate with Omega holding his own against Ishii. Ishii actually took control after a suplex and Omega rolled out of the ring. They brawled out into the crowd and were out there for a long time with the ref not even counting. When they came back to ringside Ishii hit a suplex on the matts but Omega landed on his feet. Omega then hit one and Ishii landed right on his head. When they went back in, the Bucks set up a table on the outside. They fought for a long time just over the table with Ishii continually blocking an attempt by Omega to suplex him through it. At one point, he even bit the top rope to block it. Omega finally hit the suplex and they both went through the table. Back in the ring and they did more strong style stuff. Omega had his first attempt at the One Winged Angel but Ishii reversed into a DDT. 25 minutes in they were trading hard chops and the place was coming unglued. Omega hit a high knee but Ishii blocked another with a headbutt. Omega hit another high knee and then Ishii hit a lariat out of nowhere. Ishii hit a One Winged Angel of his own but Omega kicked out at two. Amazing finishing sequence as Omega hit a neckbreaker and a running knee. Ishii kicked out at one. Omega hit a reverse Frankensteiner and then another jumping knee and then hit the One Winged Angel for the pin. Cody grabbed the belt from Omega and they teased dissension but eventually they embraced. Omega cut a total babyface promo saying it's been a tough year but they've done what they set out to do and took New Japan to a new level.